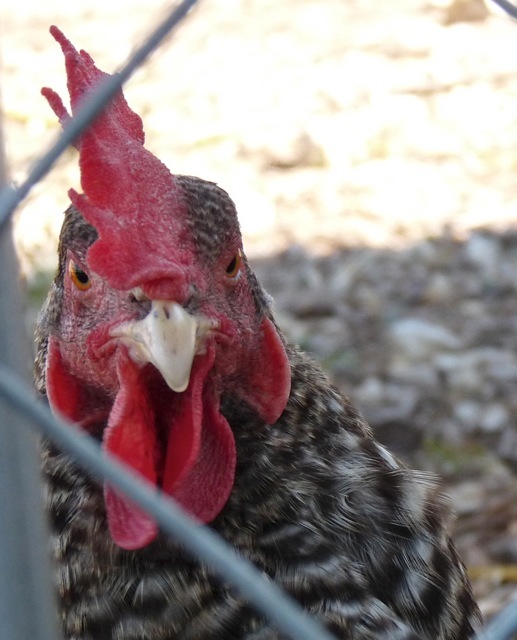 Pic: Maggie, the unrepentant egg-stealer. At least she doesn't eat the hens. Over the Summer the chickens, one by one, started laying eggs in secret places outside of the coop. 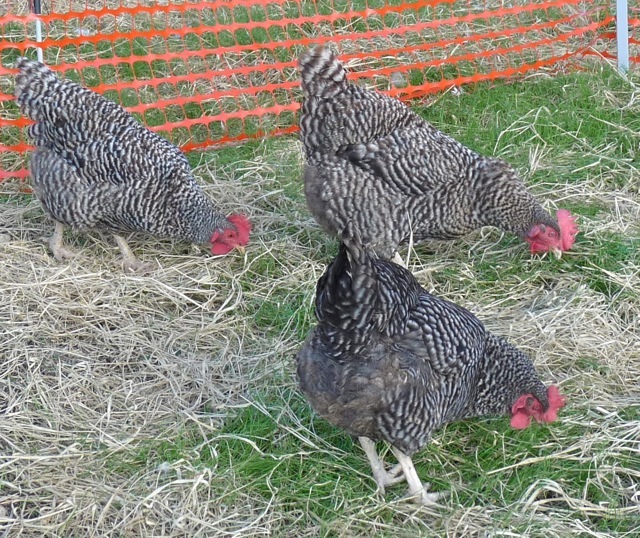 Maybe there were too many broody hens taking up the favorite laying boxes over the past few months. Maybe they started laying eggs elsewhere due to the stress of the heat. All I knew was there were less and less eggs to sell through the co-op, and Maggie's coat was getting softer and sleeker (she has a keen nose for finding errant eggs... and eating them). As of the past few weeks, I've been lucky to get three eggs a day from 25 laying hens, when closer to a dozen is the norm. Hrmm. We've been waiting for the weather pattern to change to consistently cooler temps, and it's finally done so. 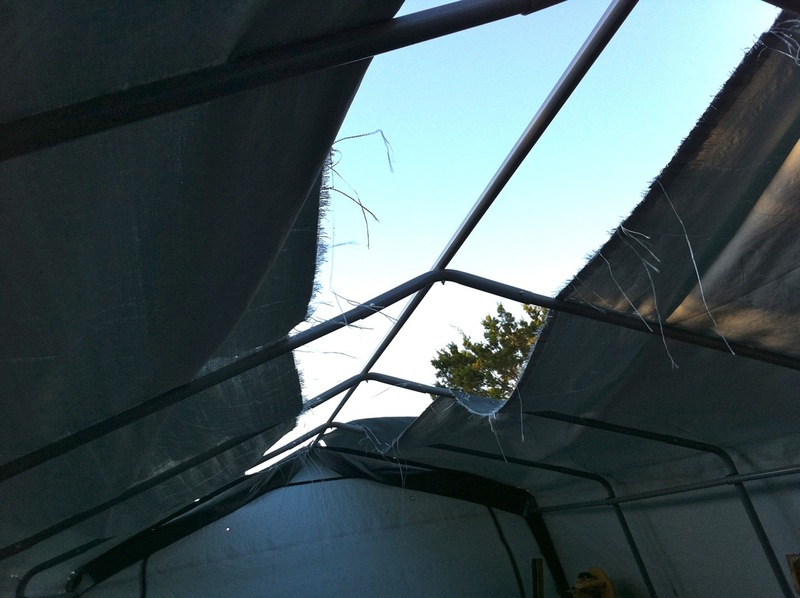 At dusk last night, after the chickens were all snug roosting inside the coop, Spouse & I stealthily erected a temporary fence around the chicken coop. 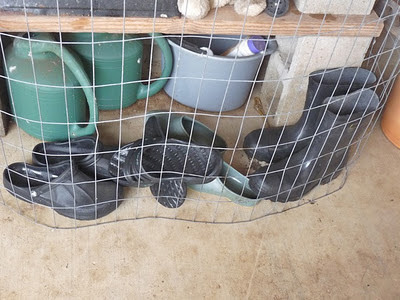 By fencing in the chickens for a few days, it should retrain the chickens to use the nesting boxes instead of their favorite hidey-holes. Unamused, I think it may be safe to say. I'll let them out to run around after 2:00PM, so they won't be cooped up all day - just long enough so they'll have to uncross their legs and lay an egg in the proper location. Pic: Ducks at the buffet. First planting test was around the young orchard trees. Grasses can be nutrient hogs, but the trees are close to going dormant for the season anyways, and the need for erosion control is paramount at this point. Rye grass was planted in a circumference around the base of the trees, then covered with old rotted/manured bedding hay. [I smelled reeeally special after spreading that stuff around.] The first week the areas received spot watering to keep the soil moist for germination. Then the trees received their usual scheduled watering - recycled duck/goose pool water - about every 5-7 days in rotation. The grass continued to grow, and is doing fine. 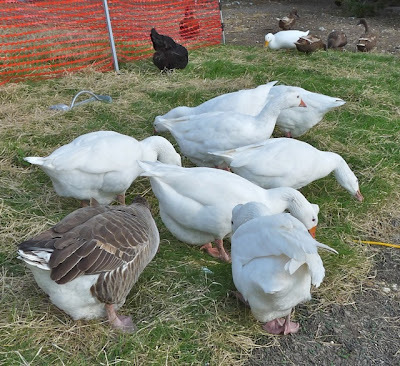 The trees all have a wide circumference, short height wire fence around their bases to keep the geese from chewing on their trunks, but am now opening one tree-fence at a time to let the poultry & waterfowl graze. Pic: Geese take a turn at the buffet table. Next test: fenced off & seeded a 6' x 12' section of upper "lawn" with a combination of rye grass and bermuda. The bermuda grass is a warm weather grass, but it was leftover from previous plantings, so tossed it in with the rye seeds. Soil temperatures should sprout both. Recycled a rotted bale of hay, loosely covering over the seeds so the still-warm sun wouldn't fry their sprouting efforts. In two weeks time, there was a lovely patch of green. This patch should anchor the soil, and hopefully stop any runoff from sections that don't have grass yet. 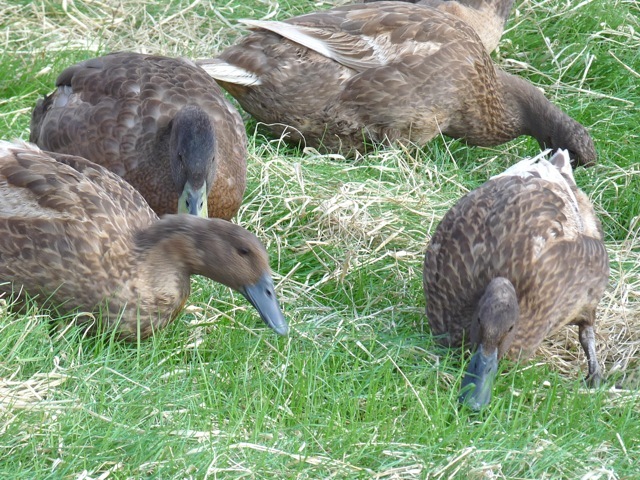 I'll only open the grassy area every other day or so, lest the birds eat the grass to the bare soil. They do receive regular greens - I feed them heads of romaine or other lettuces every morning - but it's not the same as grazing grasses on their own. Pic: Now some of the chickens get their feed on. OMG, BUFFET!!!! Yesterday I fenced off an 8' x 12' section (overlapping a small part of the original 6' x 12'), and have seeded it not only with annual rye grass, but with cereal rye, leftover bermuda, leftover native grasses, and a trio of clovers. Kitchen sink planting! Clover doesn't do well here in the summer - too hot & dry - but it just might be okay as a cool season annual. I overseeded the rye grass by comparison to everything else, as that's the one thing most likely to sprout at this time. Plus, rye grass seed is cheap. The native grass seeds will hang out just fine until Spring. 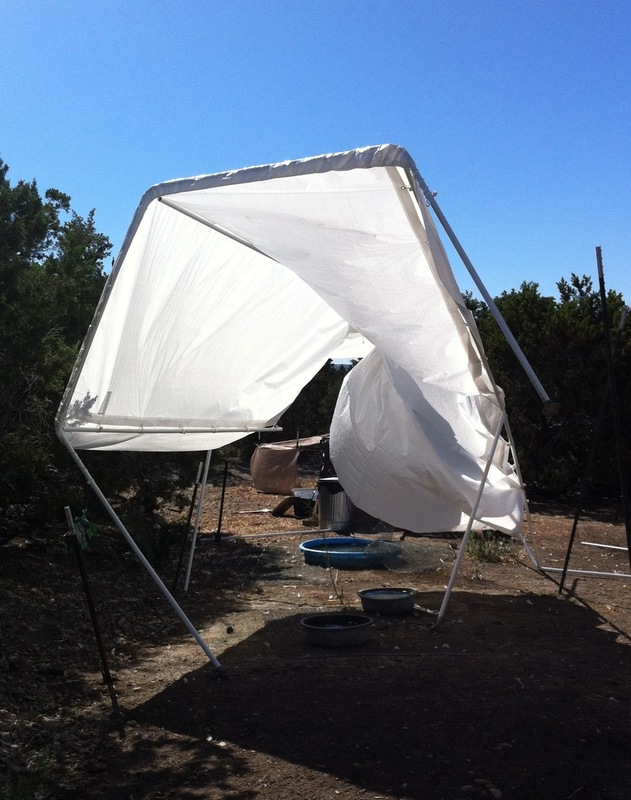 Both of these shelters - the first pic is the shade structure, the second, a temporary shed - were trashed in one single cold-front moving into the area yesterday. The shade structure got blown so hard it pulled metal fencing stakes - to which the shelter was anchored - right up out of the ground. I was able to put the shelter back together, but it took some duct tape on the pole joinings to keep the poles from twisting about. I'll have to drill holes through the joints and thread bolts through them if I want to continue using this structure for any length of time. 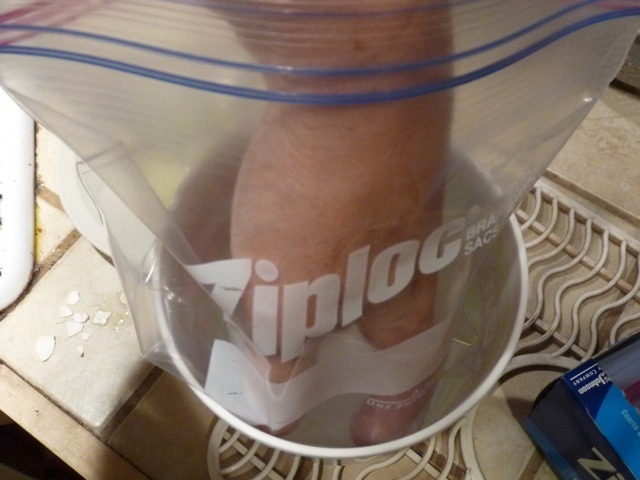 Spouse was eyeball-deep into some computer issue or another, and I needed to get the big vat of chicken stock put away stat. We had decided not to can this time, but to freeze instead. 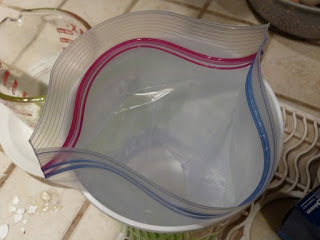 I pulled out a box of quart-sized freezer bags, and was stopped short - how the heck was I gonna get the stock into the baggies all by myself without a huge, complicated mess? 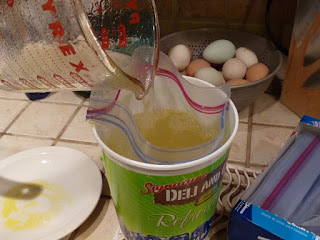 I needed some way to keep the baggie open so I could pour the stock inside. 1. Have the 44-ounce cup and quart-sized freezer baggies ready. Check! 2. 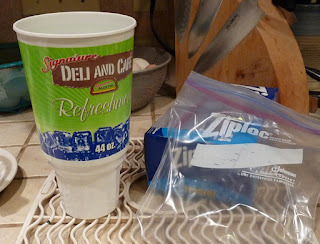 With clean hand, push the bottom of the baggie into the cup. 4. Fill with whatever you're processing. 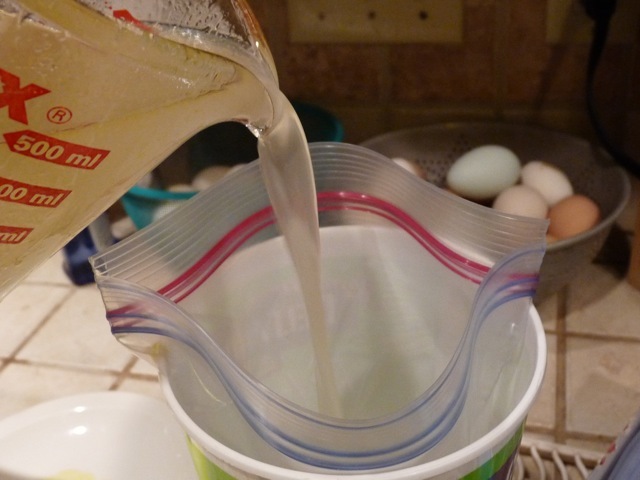 Here's a 16-ounce measure cup pouring stock, for a total of four cups of liquid. 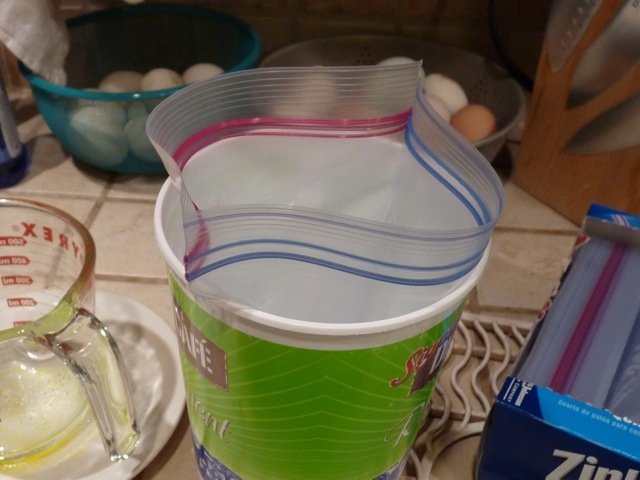 Due to being made of thicker plastic, the freezer baggie held up easily without assistance, even while being filled with liquid. I don't know if a thinner sandwich baggie would hold up as well, but maybe one could try using a paper/binder clip of some sort to hold one side (or more) of a baggie to the rim of the cup. I could see this technique being used for any type of filling needs - liquids, solids, etc. Anyhow, though I'm sure someone on the interwebs has to have already thought of and posted this idea, this was the first time the idea occurred to me, and it worked so well I'm passing it on to you. Hope you find it useful, too! 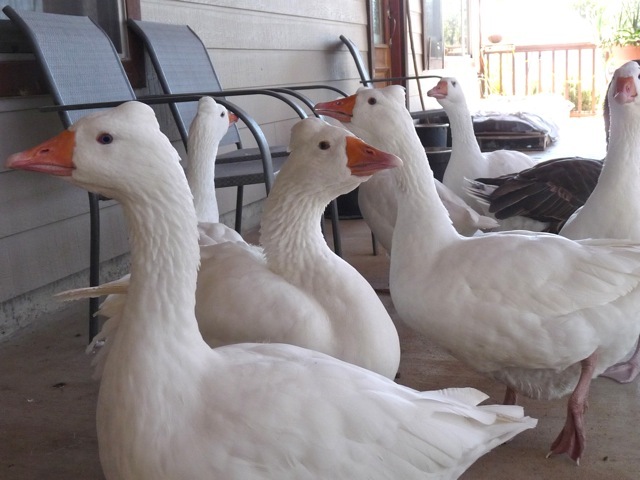 I spent some time on the porch with the geese... you know, hanging out, taking pictures, being buddies. Before I could do that, they had to make sure I wasn't bugging them. They gave me a good stare down. Figuring I wasn't going to bug them (too much), they got comfy and started doing their usual routine: chewing on things. 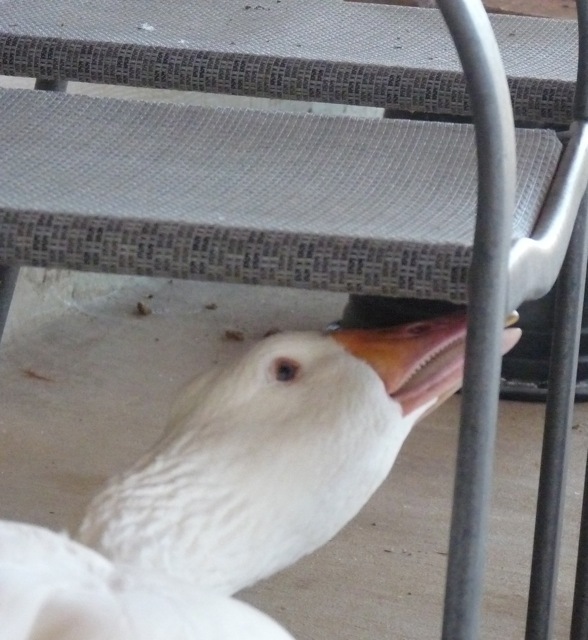 Babs chewing on the porch chair. 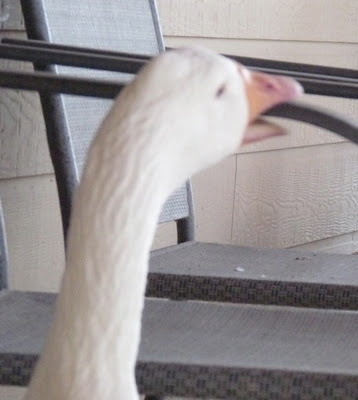 These chairs are the only ones we've found that have stood up to the destructive powers of the geese. Not for lack of trying, however. This cord was previously plugged into an electrical outlet. 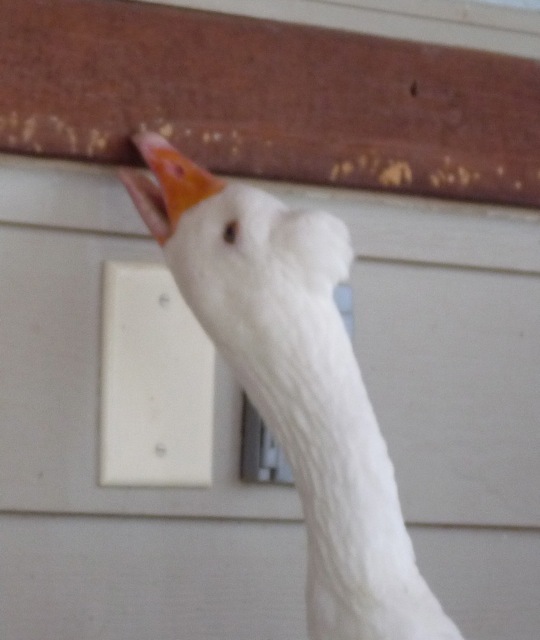 Goose was lucky not to have been cooked. I'm lucky to have a Spouse that knows how to repair these kinds of things. 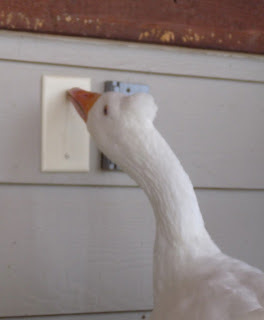 Goose attempting to chew on wall plate screw. Because it's there, you know? And now, chewing on the window trim. The grating sound will get you up from a sound nap, I assure you from experience. 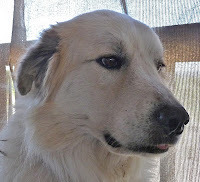 Eventually they'll move on, perhaps bullying Emma the dog away from her dog food, or complaining loudly about something or another that is invisible to the naked human eye. It's a goose thing, you know. Power Washer for the Win! Spouse purchased a low-end consumer power washer to try out a few weeks ago. 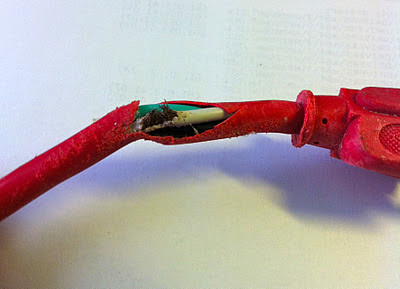 The input connector, made of plastic, broke off immediately (I did say "low end", right? ), but it was fixable with a few hose repair parts, and has been chugging along ever since. It does give me pause now & then when I contemplate that it runs off electricity, as we all know how well water & electricity get along with the human body... regardless, there are excellent water-saving benefits using this machine. 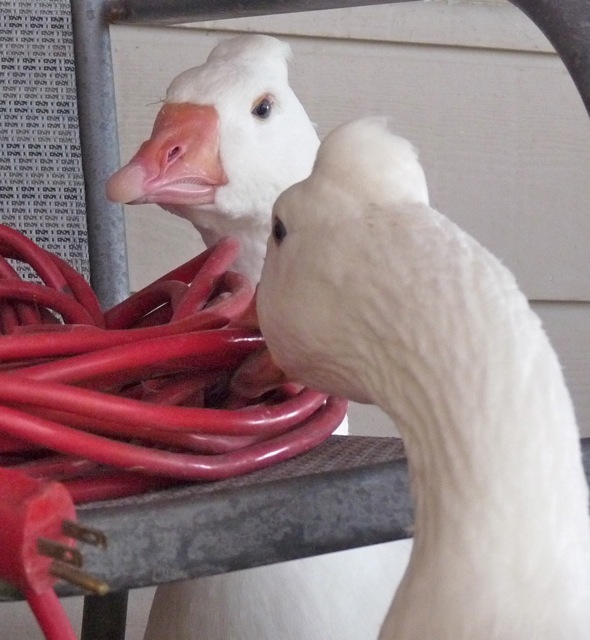 It quickly powers off the morning Apocalypse of Poo that the geese leave on the porch overnight, and yet it's not so powerful that I have to worry about flaying skin off my body if I accidentally mishandle the nozzle. 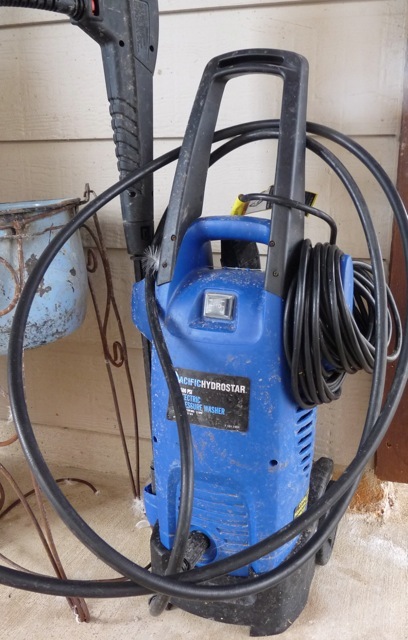 I've also used this power washer to clean out the tenacious algae on the waterfowl kiddie pools and all the drinking bowls. What took serious elbow grease, a stiff brush, and a bit of bleach (which I try to avoid using as much as possible), the power washer takes care of in seconds flat, and does a much better job. One other cool job it does: cleaning shoes. I like to clean all the warm-weather flip-flops, water shoes & clogs at the end of the season, before they go into cool-weather storage (also known as the "back end of the closet"). 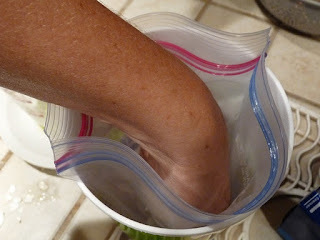 The shoes with nylon webbing or a bit of cloth on the straps can be especially tough to clean. The powerwasher got all the dirt out and off with two passes of spray. The toughest part was keeping the shoe in place - the pressure sometimes would knock the shoe out of the way. 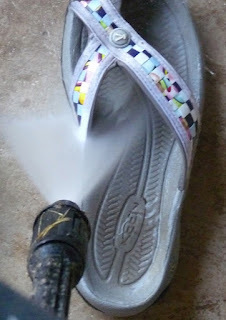 By the way, watch carefully the footbeds of your shoes when pressure washing - a softer plastic footbed may tear a bit. Eight pairs of shoes cleaned in just a few minutes. I feel like a 1950's housewife with a newfangled washing machine! Pic upper left: Pacific Hydrostar electric pressure washer (no, we're not affiliated with Habor Freight, we just spend alot of money there. Pic upper right: shoe getting washed - impressive!